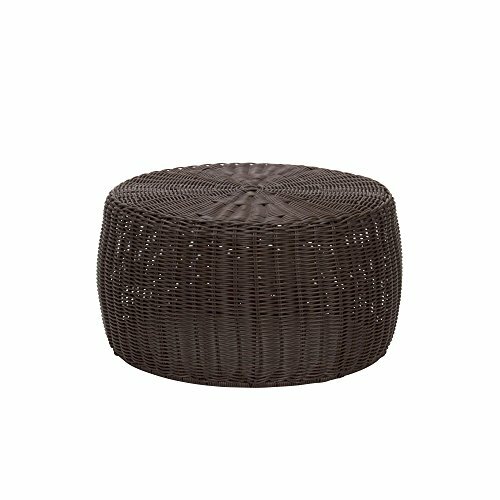 Household Essentials Resin Wicker Low Table is just about a foot high, and perfect for lounge spaces indoor or out. It works wonderfully as a foot stool or even a low seat. The sturdy, resilient wicker is smooth and weather resistant, so it works well in transitional spaces. Perfect for 3-season rooms, porches and covered patios. It can even be a simple accent to your living room for eating around the coffee table. With a sturdy metal frame and sturdy resin wicker, it's the right piece for an active household. It can even be turned upside down and used as stylish storage--it barrel shape makes a very attractive basket! Enjoy beautiful resin wicker in your home, indoors and out, with this low barrel table. Measures 9 inches high, 16 inches wide, and 16 inches deep.